This lemon creme brulee is the ultimate dessert for lemon lovers. 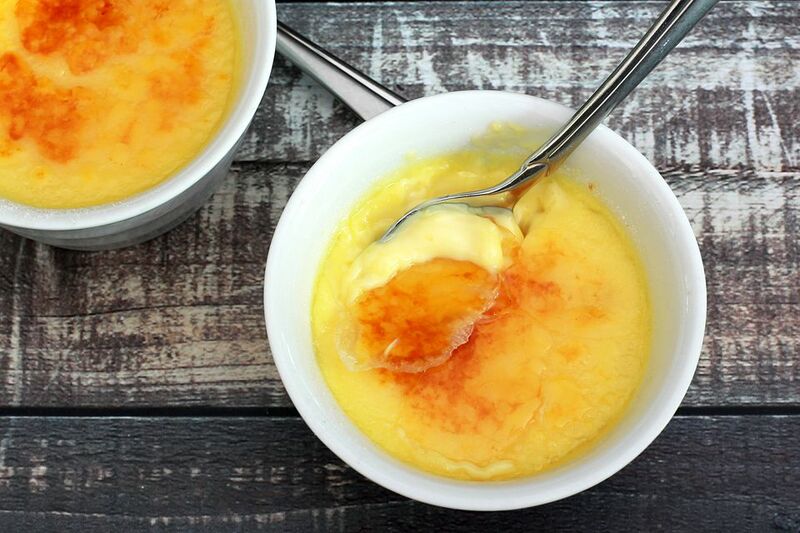 The creme brulee is full of lemon flavor, and it's very easy to prepare and bake. You can make creme brulee up to 2 days in advance. Keep it covered in the refrigerator and don't torch it until just before serving. You can even freeze the custards! Just wrap each one in plastic wrap and store in the freezer. Let them stand at room temperature for about 5 to 10 minutes; torch and serve. Although creme brulee needs no embellishment, you might garnish each custard with a small dollop of whipped cream and the optional candied lemon peel along with a sprig of mint. With a fine grater, zest 2 lemons. Set the lemon zest aside and then juice 1 lemon. Refrigerate the second zested lemon for another use. Place six 4-ounce ramekins or four 6-ounce ramekins in a large baking pan or roasting pan. Put the heavy cream and 1/4 cup of granulated sugar in a medium saucepan. Add the finely grated lemon zest—about 2 tablespoons—to the cream. Heat until the cream begins to simmer. While the cream is heating, beat the egg yolks and salt in a small bowl. Slowly whisk the hot cream mixture into the egg yolks. Add 2 tablespoons of lemon juice to the mixture along with 1/2 teaspoon of vanilla extract. Divide the cream mixture evenly among the 6 ramekins. Add boiling water to a depth of about halfway up the ramekins. Bake the custards for about 30 minutes, or until the creme brulee has only a slight jiggle in the center when moved. Remove the pan from the oven and leave the ramekins in the water bath for 15 minutes. Remove the ramekins from the pan. Discard the water from the pan and place the ramekins back in the pan. Refrigerate, uncovered, for at least 3 to 4 hours, or until thoroughly chilled. Just before serving, top the custards with about 1 to 1 1/2 teaspoons of superfine or raw sugar. Gently rotate the ramekin on the countertop to distribute the sugar evenly over the top. Slowly caramelize the sugar with a blow torch or a kitchen torch. The edges of the ramekins will get hot as you caramelize the sugar, so wear an oven mitt to move them. Alternatively, you may place the sugar topped custards in a pan and place the pan under a preheated broiler. Broil just until the sugar has caramelized, rotating the pan about halfway through. Watch carefully. With a vegetable peeler, remove the outer yellow peel from a large lemon. Slice the strips of lemon into thin strips. Put the lemon peel in a saucepan with 2 cups of water. Place the pan over high heat and bring to a boil. Drain. To the lemon peel in the saucepan, add 2 cups of granulated sugar and 1 cup of fresh water. Place the pan over medium heat; bring to a boil. Reduce the heat to low and simmer for about 10 minutes, or until the peels appear translucent. Drain and arrange the peels in a single layer on a sheet of parchment paper to cool. Toss the cooled lemon peel with about 1/4 cup of sugar to coat. Use to garnish desserts.